I Visited my Local Scrapbook Store (Purse) Pine Cone Press is not really a Scrapbook store but they do supply me with a lot of my scrap booking supplies. Any way I use many of the Die's there. I found this really cute Luggage Die and Made this Mini Book. I used Me and My Big Ideas Paper and Haute Coutour stamp set from Stampin Up. Ribbons from Pince Cone Press and Gliter. It was very simple to make. I love the way that it turned out! It only took me one afternoon to complete. Leave me a comment if you like it or tell me how you would would have designed yours. 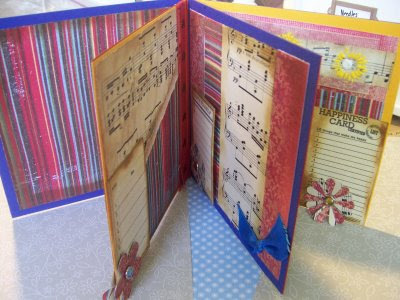 Okay, I have promised some of my friends that I would put some pictures of my Scrapbooking Room on my Blog. I finaly took some PICS! My room is a mess right now and has been for som time. I try to keep up and put everything away after each project. However, recently I have been so busy with several different projects that I have been remis. Sorry for the mess but you will get the idea. thanks for stoping by. I met a lovely lady in the local library who gave me about 30 sheet music Books! What a nice lady. Thank you so much Bonnie you are the best. Any way, in order to thank her I made her a mini Book. If you know me you will know that I'm the Mini book Queen! I used some of the sheets that she gave me for her Album. Please let me know if you like it or just leave me a comment. Both My Grandaughters are in Cheer leading and they recently both won in there compotition this weekend. They both recieved First place! How great i s that! I am a Stampin Up Demonstrator and this is a picture of my Club Girls fast at work on one of our fun projects. Not all My Girls are here this night, but we all had a great time anyway. Please bare with me while I learn how to Blogg. This is my first time doing this so, I may not be very good at it in the beginning.